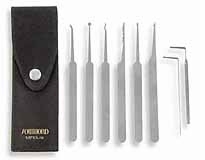 8 piece lock picking set consisting of 5 of the most effective picks with stainless steel handles, a broken key extractor and two tension tools. All fit in a very compact leather case that fits in your shirt pocket. More versatile than the beginner set, yet still affordable. This set has a different tension tool and a key extractor as additional tools that the beginner set does not have. You may find the additional tension tool to be better applied toward some locks than others. Personal preference is the key. Lockpicking is a skill. It may take practice to learn how to use these items effectively. As a result, due to the nature of these products, there will be no refunds for lock pick equipment. Sorry, gift cards, unregistered prepaid cards or International(non-USA) Cards are not accepted.. Orders with these will be cancelled.